If you’re still making resolutions for 2010, how about becoming a master of artisanal baking? The place to start is Mark Bittman’s now-famous recipe, along with his followup comments, of bread created by Jim Lahey at Sullivan Street Bakery in New York City. It was published in 2006, but it took me two years to start experimenting with it. It is nothing short of incredible and requires only five minutes to mix up. 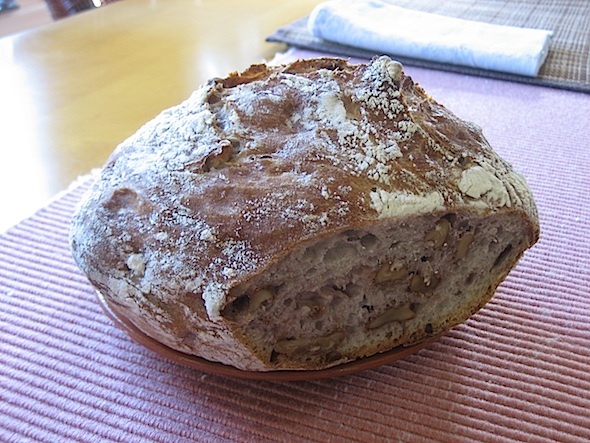 I’ve added various goodies, such as walnuts, currants, green olives and rosemary, and kalamata olives to this recipe. Stir in whatever you’re planning to add at the very beginning and use plenty of flour in the towel during the final rising stage to prevent the dough from sticking. in a pre-heated, closed container. Based on your preferences, you can add more salt or replace some of the bread flour with whole wheat flour. I plan to experiment with semolina flour, and even a gluten-free flour, at some point. I’ve also discovered that you can start the final rise early, as long as the dough is covered with bubbles. You can find out more hints and tips from Mark Bittman in another New York Times article. Here’s to fearless bread-baking in 2010. Be creative, and report your experiences and tips in a comment below this article. Sigh. I may never buy store-bought bread again.